Cedar is often used in the sweat lodge ceremony. The smoke of burning cedar is said to attract the good spirits and eliminate negative energies. 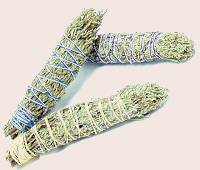 An ideal mixture of herbs for releasing bad/negative energies and restoring calmness.